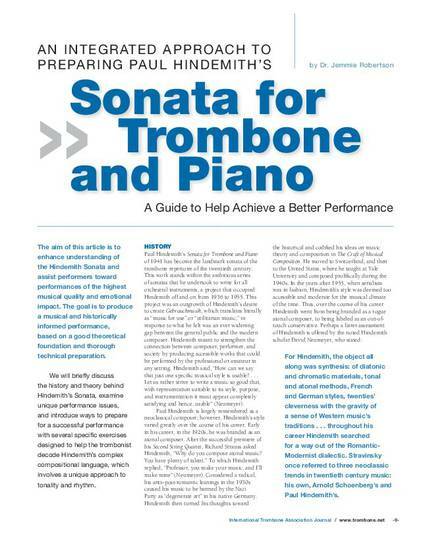 The aim of this article is to enhance understanding of the Hindemith Sonata and assist performers toward performances of the highest musical quality and emotional impact. The goal is to produce a musical and historically informed performance, based on a good theoretical foundation and thorough technical preparation. We will briefly discuss the history and theory behind Hindemith’s Sonata, examine unique performance issues, and introduce ways to prepare for a successful performance with several specific exercises designed to help the trombonist decode Hindemith’s complex compositional language, which involves a unique approach to tonality and rhythm. Available at https://www.trombone.net/journal/online/; reproduced here with permission of the editor.